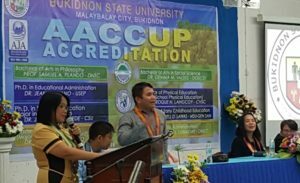 MALAYBALAY CITY (May 21) Why submit for accreditation? This to improve the quality of education of our institution, that is the basic, Dr. Jean L. Bejano of the University of Southeastern Philippines (USEP) said in her message in the opening of the Accrediting Agency of Chartered Colleges and Universities in the Philippines (AACCUP) Preliminary Survey Visit on May 21, 2018. Bejano, who is the survey team’s over-all coordinator, added that the accreditation seeks to find out the strengths and weaknesses of the university’s academic programs and to level up standards of excellence mandated to colleges and universities. “The long range vision of the AACCUP is to develop among SUCs what we call the culture of quality – thus the quality assurance is then rested inside the school system,” she added. She said SUCs shall maintain a certified roster of quality programs and processes. “This preliminary survey visit is a prerequisite to a formal survey visit to determine the readiness level of your academic program,” she added. She said the current visit is a document-focused process, which means that the variables to consider are the availability and adequacy of documents as listed in the instruments. According to its website, AACCUP is the youngest of the four accrediting agencies in the country until late 2003. Under its charter, one of the functions is to develop a mechanism of, and conduct the evaluation of programs and institutions. “Rest assured that our presence here is to support you and lend a hand to you. We are just one family state institution, we are here to help rather than put you down,” Bejano said, responding to a message by Mr. Dante S. Victoria, Jr, vice president for administration, planning and development. Mr. Victoria stood in for the university president, Dr. Oscar Cabañelez, who is in Manila Monday to attend a meeting among presidents of SUCs for the Philippine Association of State Universities and Colleges (PASUC). He cited that BukSU, which is turning 94 years old as an academic institution and 11 as a university on June 10, is ready for the survey visit. 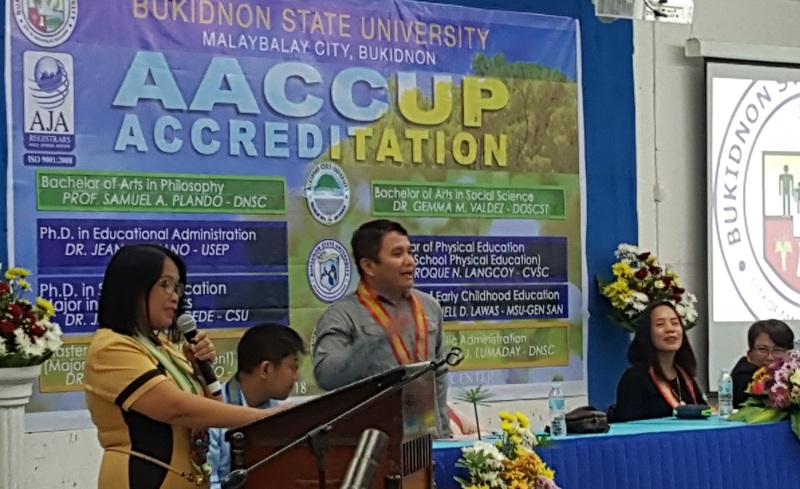 “We are used to activities like this (accreditation),” he added citing BukSU’s preparations to level up its ISO-certification. He cited that the university is home to students, faculty and non-teaching personnel from Bukidnon seven ethnic tribes. Mr. Victoria said quality assurance cannot be compromised. “Accreditation will always be there. The standards are there. The bulk of the job is to meet these standards,” he added. He exhorted the BukSU AACCUP task force and working committees to consider the visit as an “exciting time” and not to be feared about. “Consider this a learning experience … the accreditors are here to help, encourage and uplift the university … so let’s look at this positively,” he said.